Deidre McIntosh is determined to make her new venture a success and works tirelessly on developing her own cookie line. While navigating her boyfriend’s wealthy family where she doesn’t quite fit in, especially around his sister who becomes determined to see the back of her, things don't go exactly as she planned. Can she pull things together and see all of her dreams come true? I enjoyed this single girl tale. 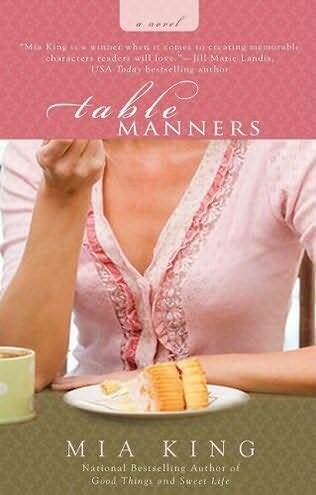 Table Manners was well written, full of mouth watering recipes (there’s even a recipe section in the back) and I enjoyed the character and her adventure, however this book just didn’t grab me and I thought this chick lit novel was relatively average. This is chick lit with a heroine who has drive and determination and a career she loves. There are laugh out loud moments and some mouth watering descriptions of high end cookies and meals she creates. I got the impression throughout the novel that Deidre would have landed on her feet if she was unsuccessful at saving her new company, her man and/or both and I found that refreshing, while at the same time I don’t think it gave me enough to latch onto. The stakes didn’t seem particularly high maybe. I didn’t get sucked in or emotionally involved as I would have liked to and although I had fun watching Deidre flounder to try and save all that was dear to her, I just wasn’t blown away by this novel. I thought Table Manners was a solid 3 Star. I didn’t hate it and would gladly read another of Mia King’s novels, but I didn’t adore it either, so it’s smack dab in the middle.